Stronsay and Sanday are the two most easterly of the larger northern islands of Orkney, while Eday lies centrally amongst the northern islands. 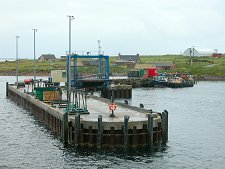 Regular ferries connect all three islands with Kirkwall. 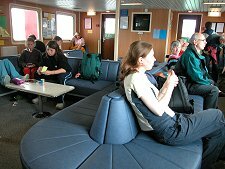 For current fare and timetable information, and for bookings, contact Orkney Ferries via their website. 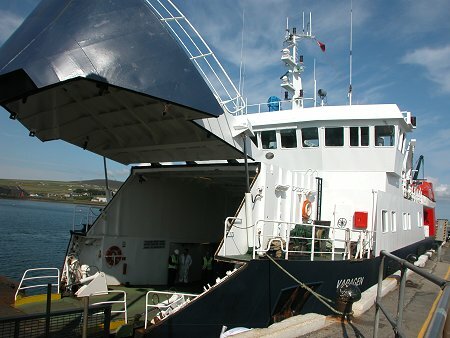 Services to Stronsay, Sanday and Eday are operated by three of Orkney Ferries' vessels, the MV Varagen. 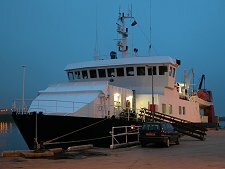 the MV Earl Sigurd, and the MV Earl Thorfinn On this page we focus on the MV Varagen. 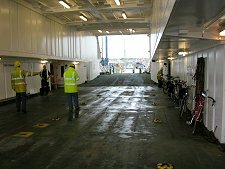 giving more information about the MV Earl Sigurd, and the MV Earl Thorfinn on the feature page covering the Westray Ferry which is operated by the same three vessels. When planning visits to these three islands it is worth looking fairly closely at Orkney Ferries' timetables. The pattern of services vary on different days of the week, with the result that it is possible to plan an excursion to certain islands on certain days of the week, but not on others where there might only be one sailing during the day. It is also worth noting that many of the sailings serve two islands and this should be considered when comparing the time you will get on an island compared with the travelling time to and from it. 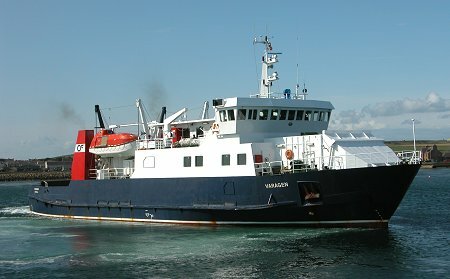 The MV Varagen can carry 144 passengers and 32 cars, giving her a larger vehicle capacity but smaller passenger capacity than the two Earls. To the casual observer it seems pretty obvious that the three superficially similar vessels were always intended to share the services to the northern islands. The truth is very different. 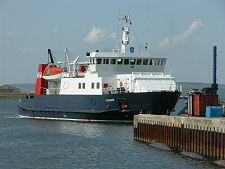 MV Varagen. was built at Cochranes Shipbuilders in Selby, Yorkshire, in 1989. She was designed to provide a service from Gills Bay near John o' Groats to Burwick at the southern tip of South Ronaldsay. 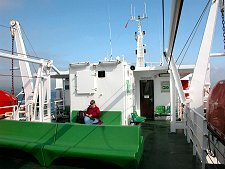 It was felt that with a planned 30 minute crossing this would be able to compete effectively with the long established ferry service from Scrabster near Thurso to Stromness. In the event, problems with dredging at Burwick meant that when the service started on 15 August 1989 it crossed between Gills Bay and Houton, near Orphir. The service had to be closed only a month later on 16 September 1989 when heavy seas damaged the Gills Bay terminal. The planned service was abandoned and the MV Varagen was laid up until finally moving to its current role in August 1991. 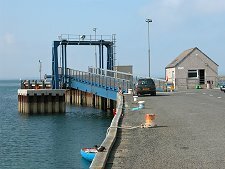 Ironically, Gills Bay is now the southern terminal of the Pentland Ferries service to St Margaret's Hope; while Burwick is the northern terminal for John o' Groats Ferries' passenger-only service from John o' Groats. As you'd expect from its greater capacity, the vehicle deck on Varagen seems larger than those on the Earls. 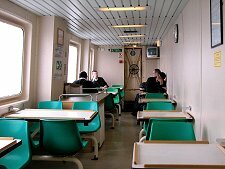 Passenger accommodation centres on a lounge behind the bridge, while behind this is a fairly large sun deck between the lifeboats which extends down both sides of the passenger lounge. 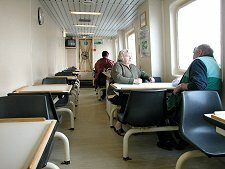 On the deck below is a smaller passenger lounge on one side, and a small cafeteria on the other, which offers, amongst other things, Orkney Ferries' excellent bacon rolls. 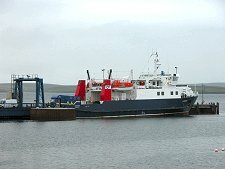 Full details, including current timetables and prices can be found on Orkney Ferries' website.